As familiar and known a sight as that of the Giza Pyramids, the medieval Citadel sits conspicuously over the haze of Cairo’s minarets, with the Mohammed Ali mosque glimmering like a beacon to all travellers, visitors and Cairenes alike. The gentle breeze from the hilltop location brings to mind a legend about Saladin, the builder of this medieval fortress in the 12th century. In the search to build a proper fortress against the Crusaders, he hung pieces of meat throughout Cairo and swore that wherever the meat stayed fresh the longest would become the location of his fortress. All the meat he placed was ruined in a day except for the meat hung on a hilltop near Cairo, where the fresh breeze kept the meat fresh for days. Who knows? Maybe he built the Citadel on a hill because in his native mountainous Syria most fortresses were built in strategic high locations, or maybe fresh meat was a big deal to Saladin. The Citadel is a popular destination for tour groups and local school field trips. While most tourists are taken to the Hagia Sophia inspired Mohammed Ali mosque, they might miss the great sites that lie nearby, marking massacres, harem palaces, spiral wells, royal court drama, crime, and ancient Egyptian ruins. After visiting the grand Mohammed Ali mosque, built in the early 1800s to serve the royal court, take some time to wonder through the more sensational sites at the Citadel. To the northwest of the mosque lies the Police Museum. Even though it’s a bit low budget, there is an interesting room devoted to some of the more famous crimes and criminals in Egypt over the last century. Look for the exhibit about the two Alexandrian sisters, Raya and Sakina, who ran an underground prostitution operation and would lure women into their apartment where they would be robbed, killed, and buried. If only their next-door neighbours, the Alexandrian police, had been nosier, their crime spree wouldn’t have lasted years. A little known sightseeing tid-bit, the Ottoman Mosque and palace garden are ‘hidden’ behind the museum and are well worth a visit. Before Mohammed Ali Pasha, the famous Egyptian reformer, took power in Egypt in the early 1800s, the Mamluks had controlled Egypt for centuries building sparkling palaces and glamorous mosques on the Citadel. In order to establish supreme power, Mohammed Ali needed to get rid of the Mamluks and so proceeded to invite hundreds of their leaders and royalty to dine with him at the Citadel in celebration of his son leaving on the Hajj, the Islamic pilgrimage to Mecca and Medina. After the grand banquet he had the Mamluks escorted through a narrow street with gates on each end which shut once all the Mamluks were inside. With snipers appearing on the walls, the Mamluks were massacred giving Mohammed Ali the power he so craved. 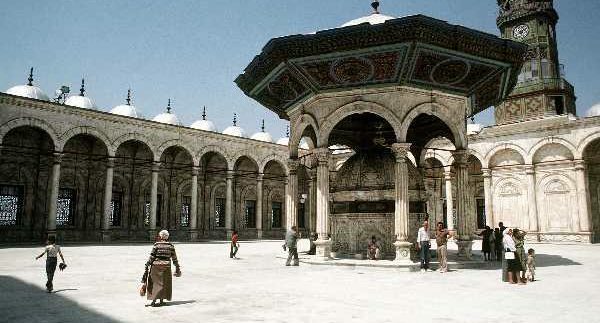 He demolished all the Mamluk palaces and buildings on the site, except for one – the Al-Nassir Mohammed mosque. Used as a stable by Mohammed Ali, the Al-Nasir Mohammed Mosque is a site rarely visited by foreign tourists even though it is directly east of the mosque. Here you can see columns that were stolen from ancient Egyptian, Greek, and Roman edifices. Light isn’t playing a trick on your eyes as you notice the deeply gorged walls – they used to have luxurious tiles and stones which have been used for other projects by Mohammed Ali. Talk about a cycle of karma here! Just northeast of the Al-Nasir Mohammed mosque lies Egypt’s National Military Museum, a former harem palace for Mohammed Ali. Displays of airplane, cannon, and various artillery are placed all over the gardens surrounding the museum. Even though the museum is filled with unique artefacts like “the world’s most ancient cannon” and “a model of the Prophet Mohammed’s (PBUH) sword”, it’s easy to imagine Mohammed Ali’s harem women lounging around, locked away from the public eye. -Walking around the Citadel can be brutal and exhausting under the powerful Egyptian sun, even during the winter. Make sure you wear good footwear and bring water to make the experience more enjoyable and allow you more energy so you can see the amazing things here. There are a few drink and snack stands at the Citadel, located on the road to the Mohammed Ali mosque, which are over-priced. There is also a cafeteria at the National Military Museum where snacks and water are moderately priced. -Unless you are travelling with a pre-arranged tour, the easiest and cheapest way to get there is by taxi, which depending on traffic will cost around 10-15 LE from downtown. – Early afternoon brings the heaviest crowds, with Egyptian school field trips and tourists, so leave early if you want to avoid them.